Water temp for dishwasher? How hot is the water in a dishwasher? If you notice that your dishes are not clean after a wash… or the dishwasher detergent tablet has not dissolved, check the water temp. The water that enters your dishwasher must be at the minimum 120 degrees Fahrenheit. The water temp that enters your dishwasher should never be more than 150 degrees Fahrenheit. Water temp between 120F and 150F is the most ideal water temp for your dishwasher to run efficiently. 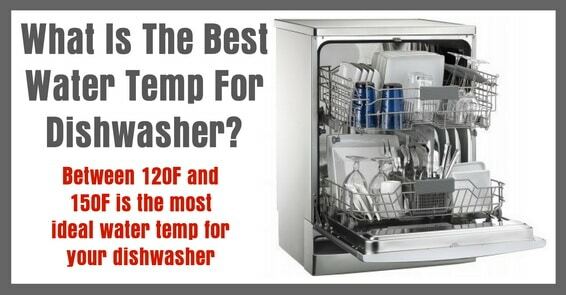 What Is The Best Water Temperature For Dishwasher? Some dishwasher manufacturers say the water temp for your dishwasher should be from 130°F to 170°F or in Celsius 55°C to 75°C. If the water in your dishwasher stays in between these temperatures, you should have no issues. If you want to check the water temp entering your dishwasher, use a thermometer. Usually your dishwasher is in the kitchen and near the kitchen sink and faucet. 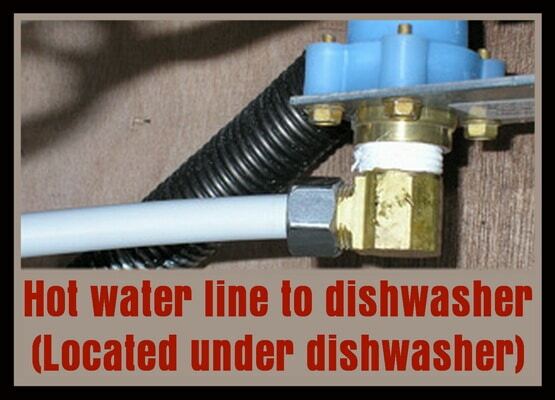 Turn the kitchen faucet on nearest your dishwasher and run hot water. Put your thermometer in a cup and allow the hot water to run into the cup. Leave the thermometer in the cup for a few minutes while running the hot water in the cup and then check the temp of the water by observing the thermometer. If after running this test you observe that the water is not reaching at least 120F, then the water is not hot enough for your dishwasher to run effectively. You can try adjusting the water heater in your home if needed. Always let the hot water run in the sink before starting your dishwasher. By running the hot water in the sink first, this ensures your dishwasher is starting it’s wash cycle with hot water from the start. This will improve the wash performance, dry the dishes better, and always dissolve the detergent tablet. Note: If you have newly installed your dishwasher, be sure the dishwasher water line is connected to the hot water line and not the cold water line. If you have issues with your dishwasher not cleaning the dishes properly, not drying correctly, and not dissolving the tablet, please leave a comment below and we will be happy to assist you with your dishwasher issue. My dishwasher is doing cycles correctly but presents a problem of overheating to a point you can not approach your hand to the dishing area when you open the door. My dishwasher has a problem with mold building up especially at the bottom where the water drains. It seems to be the water temp. I’ve adjusted the water heater so it comes out of sink at 130 F (nearest dishwasher). Initial fill in dishwasher still comes in at 100F. Second fill is only up to 120 F with high temp wash on. Do you know what the issue could be. My water heater is cranked up pretty high to reach the 130 temp as well.